It’s baaaaack! I hate this time of year. This entry was posted in Uncategorized and tagged depression, mental health, mood disorders, reblogs, SAD, Seasonal Affective DIsorder, seasonal depression by luckyotter. Bookmark the permalink. I have a little bit the same… its sad to let go of summer.. but I love snow.. i thought you also loved snow?? I will be with you.. wanting to hibernate. through Oct-Dec. Although I also find holidays stressful , I wont participate in such a stress. I buy one gift for my kids , I dont buy new decoration and I will be away at the mountains. I dont agree to be part of the stress. The time should be for inner thinking and plans to be s better person but its all turned into a commercial stress. No way il making part of that. I profit that Im away from my family who do live the stress of christmas. In latin America they make a huge thing out of it.. and have my peace! Keep posting please! Let us know how you do to cope. I’ll get through it. Once the holidays are over, it gets better. Snow? Not a big fan of it. It’s pretty to look at though, but slogging through it to get to work? No thanks. 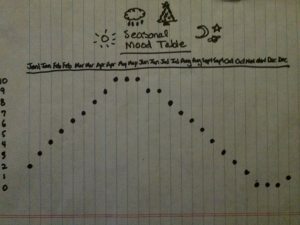 I think it makes sense that your SAD hits harder when the hormonal change (melatonin) starts and by a few months later you’ve adapted to it in some way. Also, after the Winter Solstice the days begin getting longer, so there’s more light. I’m sorry you have to deal with all that. I take melatonin to help with the sumptoms and also have a Light Therapy Lamp one of my readers sent me (which needs new batteries). I like the crazy dreams the melatonin gives me, haha! Some people hate them, but I think they’re cool. They’re much more vivid than regular dreams.